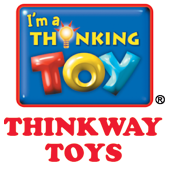 THINKWAY TOYS is a Canadian-based company responsible for creating, producing and distributing creative and innovative high quality toys. Specializing in Licensed Properties since 1990, Thinkway has produced toys for companies including Disney, Pixar, Universal and Warner Brothers. Licensed properties include the Toy Story films, WALL-E, Monsters, Inc., A Bug's Life, The Incredibles, Cars 2, Despicable Me 2, Minions, Wreck-it Ralph, Planes, Spider-Man, The Avengers, The Dark Knight, and the Star Wars saga. Our motto says it all. We combine cutting edge technology, innovation, and great characters to bring toys to fun, 3-dimensional life! When you see the "I'm a Thinking Toy!" logo on a toy or package, you know you're getting the best! With the film coming out in only 8 months, Disney was having a hard time finding a toy company willing to produce merchandise with such a short turnaround time. All the larger toy companies had passed on it. The then small Canadian company, THINKWAY TOYS, saw the potential and took up the challenge. Working with Disney Canada and Pixar directly, Thinkway met the challenge and more! This began a unique relationship between Pixar and Thinkway that continues to this day.